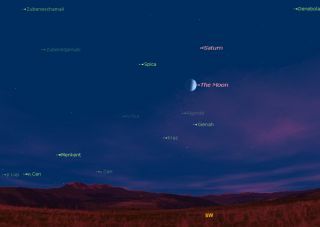 This sky map shows the location of the moon, saturn and the bright star Spica on July 7, 2011 at 9 p.m. Local Time as seen from mid-northern latitudes. As darkness falls this evening (July 7), make sure to check out the south-southwest sky. About one-third of the way up from the horizon to the point directly overhead you will see yet another in the monthly series of triangular configurations formed by the moon, a bright star and a bright planet. The planet is Saturn with its remarkable rings. For those with access to even a small telescope, the sight is enlarged into one of the finest showpieces in the night sky. This sky map of the moon, Saturn and Spica shows how they will appear together tonight. The rings can be glimpsed with a telescope magnifying at least 30-power. If you own a telescope with an aperture of 4 inches, you can get a very fine view at 100-power; with an 8-inch telescope, try 200-power, while with a 12-inch telescope, 300-power will be more than sufficient. Saturn's rings are not continuous sheets, but are composed of countless billions of tiny particles, each one circling like a moon around Saturn and reflecting sunlight. Many of these particles are ice crystals and those individual glints of reflected sunshine appear to run together at the great distance of the ringed planet now currently 899 million miles (1.45 billion km) from Earth. Finally, there is the bluish-white star, Spica, which will sit a dozen degrees to the moon’s upper left. Spica and Saturn appear practically the same in brightness, being separated by just 0.1 magnitude in brightness, with Saturn appearing just a trifle brighter. The triangle shape will remain in view until the moon sets just before midnight, local daylight time. Saturn and Spica will disappear into the horizon haze about a half hour later. The next broad moon-Saturn-Spica triangle in the series will be formed on Aug. 3.